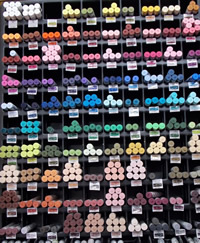 Artist quality pure pigment soft pastels. Each colour is available in different tones. Swiss made artists quality oil pastels. Individual or in a set of 12, 24 and 48. Artist quality oil pastels, pure and intense drawing sticks. Artist quality Swiss made water-soluble painting pastel. Individual or in a set of 10, 15 and 30. 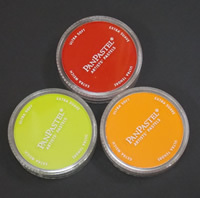 PanPastel Colours are professional artists' quality soft pastel colours packed in a unique pan format (cake-like). The special qualities of PanPastel Colours mean that artists can blend and apply dry colour like fluid paint for the first time. All PanPastel Colours are made using a unique manufacturing process requiring minimal binder and fillers, resulting in rich, ultra-soft and super-blend-able colours. Each colour is loaded with the finest quality artists' pigments for the most concentrated colours possible. The colours have excellent lightfastness and are fully erasable. Uniquely, for pastel colour, they can be mixed together for a complete painting palette.